You’ve probably heard of the islands of Saint Croix, Saint John, and Saint Thomas. They’re extraordinarily popular destinations for vacationers and cruise lines alike. These islands are the main islands of the US Virgin Islands. The US Virgin Islands lie just east of Puerto Rico and just west of the British Virgin Islands (the two are often confused, especially when the term “Virgin Islands” is used on its own). The combined area of the main islands is about twice as large as Washington DC. Despite the islands’ diminutive size, they maintain a vibrant economy that welcomes new business. A 2012 report from the US Census reflected that US Virgin Islands businesses brought in $6.8 billion in sales and employed more than 30,000 people. Reflecting the area’s huge tourist industry, leisure and hospitality employ more people than any other sector. Tourism makes up about 60% of the GDP, from the over 2.5 million tourists that visit yearly. Those tourists contributed over $300 million to the US Virgin Islands’ economy in 2012. It is estimated that 50% of the population is employed in an industry that has some tie to tourism. Further appealing to tourists, the islands allow duty-free shopping of $1,200 per person, which is twice that of any other Caribbean island, and three times more than Europe. Visitors can even mail home one gift per day, duty-free, with a value of $100 or less. Of course, the islands are also huge draws for boating and yachting. Private charters often go back and forth between the US and the British Virgin Islands. Manufacturing is increasing in frequency. The islands are known for great rum distilleries, and the financial services industry is a growing area of the economy. If you’re looking to explore business opportunities in the U.S. Virgin Islands, you’ll have a customer base that’s attentive year round due to the region’s tropical climate which doesn’t vary much as the seasons change. 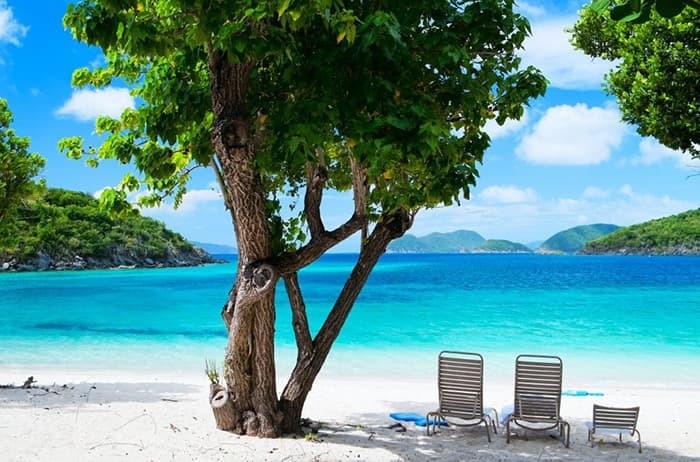 The Virgin Islands see no snow or harsh winters. The laws of the islands are a mix between the region’s own rules and agencies, and compliance with mainland United States laws. People of the US Virgin Islands are considered United States citizens, and have representation both in the US Congress as well as the Virgin Islands Legislature. Like many US states, the islands have their own court system and supreme court. They have their own constitution, but it must be approved by the United States government. The Virgin Islands is its own customs territory — visitors do not go through U.S. customs. However, mail is handled and delivered by a branch of the U.S. Postal Service, and the U.S. dollar is the primary unit of currency. The U.S. Virgin Islands do have a unique distinction that no other U.S. state or territory has: it’s the only part of the United States where cars drive on the left side of the road, a practice carried on from the days when the islands were Danish colonies. Who Lives in the US Virgin Islands? All of the tourism flooding the island with revenue more than makes up for the relatively small number of permanent residents in the US Virgin Islands — only about 106,405 people, as of the last census count reside there. Nearly a third of households have a child under the age of 18, and over half of the population is under the age of 45. It is an educated population as well — the literacy rate as of the last census was 94.9%. What the islands lack in size, they make up in beauty; Although best known for pristine beaches, many of the islands are mountainous and provide opportunities for hiking, climbing, and cave exploration. The US Virgin Islands are especially tailored to the comfort of visitors. The islands have sufficient cell phone reception, with restaurants that serve gourmet food, and resorts that pamper visitors. U.S. News & World Report recently ranked the islands as the best place for a family vacation in the Caribbean. Each of the islands has its own unique characteristics. St. Thomas is known for its high-end shops, mega-resorts, and luxuries. Some consider the island to have the best shopping areas in all of the Caribbean. St. John has more for the recreation and nature lovers, with 7,000 acres of park and gorgeous beaches. St. Croix offers fascinating tours of old-fashioned sugar cane plantations (as well as a plantation museum) and rum distilleries. The islands are full of wildlife refuges, bays with expansive pristine beaches, historic military forts, golf courses, areas for scuba diving and snorkeling, and casinos (gambling is legal in the U.S. Virgin Islands).